Reading and share top 52 famous quotes and sayings about Valuable Time by famous authors and people. Browse top 52 famous quotes and sayings about Valuable Time by most favorite authors. 1. "Humans are capable of so much more. 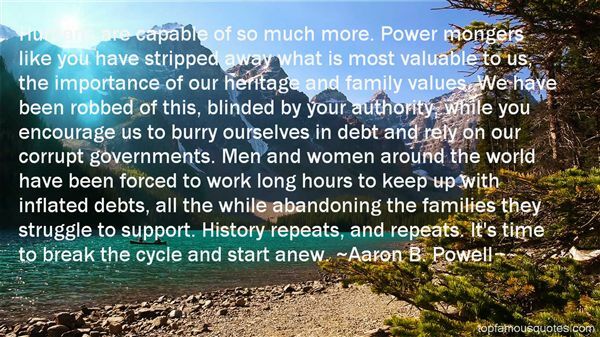 Power mongers like you have stripped away what is most valuable to us, the importance of our heritage and family values. We have been robbed of this, blinded by your authority, while you encourage us to burry ourselves in debt and rely on our corrupt governments. Men and women around the world have been forced to work long hours to keep up with inflated debts, all the while abandoning the families they struggle to support. History repeats, and repeats. It's time to break the cycle and start anew." 2. "No medicine is more valuable, none more efficacious, none better suited to the cure of all our temporal ills than a friend to whom we may turn for consolation in time of trouble, and with whom we may share our happiness in time of joy." 3. "Family involvement is a valuable thing and playing together actively can be the '90s version of it. Instead of just watching, you can do it together... something we don't spend enough time on. We can motivate and excite each other about fitness." 4. "Looking back now, I would say that this was one of the first valuable lessons I learned, and one that would be useful in my future line of work. Sometimes things go wrong. It is inevitable. But it is a mistake to waste time and energy worrying about events that you cannot influence. Once they have happened, let them go." 5. "If I start out loving you then it is impossible for me to end up hating you. I may hate how you've treated my love and kindness, I may be disappointed because I gave you all I had and was treated far less than I deserved. Maybe anger grew in me because I never knew your lies and betrayal would pierce my soul deeply. I never planned on hating you but I'm grateful love is the remedy to heal it. I will learn to stop giving away my valuable energy, time and thoughts knowing you cannot care for it." 6. "Now we realize that time is our most valuable resource, and every minute we spend in one of these meetings just sitting there is time wasted." 7. "We are fast moving into something, we are fast flung into something like asteroids cast into space by the death of a planet, we the people of earth are cast into space like burning asteroids and if we wish not to disintegrate into nothingness we must begin to now hold onto only the things that matter while letting go of all that doesn't. For when all of our dust and ice deteriorates into the cosmos we will be left only with ourselves and nothing else. So if you want to be there in the end, today is the day to start holding onto your children, holding onto your loved ones; onto those who share your soul. Harbor and anchor into your heart justice, truth, courage, bravery, belief, a firm vision, a steadfast and sound mind. Be the person of meaningful and valuable thoughts. Don't look to the left, don't look to the right; we simply don't have the time. Never be afraid of fear." 8. "Employees are your most valuable assets. They are the heart and guts of a company. This doesn't mean that from time to time, you aren't going to do what is good for the company." 9. "Time is more precious than gold, more precious than diamonds, more precious than oil or any valuable treasures. It is time that we do not have enough of; it is time that causes the war within our hearts, and so we must spend it wisely." 10. "The premise of 'Deadline' forced me to go against my own grain with a character determined to find all that is valuable in that time. I believe this is a story about redemption; how, even with the best intentions, it's sometimes found and sometimes not." 11. "I always have said that the most valuable thing I have isn't money; it's my time." 12. "As for myself, I can only exhort you to look on Friendship as the most valuable of all human possessions, no other being equally suited to the moral nature of man, or so applicable to every state and circumstance, whether of prosperity or adversity, in which he can possibly be placed. But at the same time I lay it down as a fundamental axiom that "true Friendship can only subsist between those who are animated by the strictest principles of honour and virtue." When I say this, I would not be thought to adopt the sentiments of those speculative moralists who pretend that no man can justly be deemed virtuous who is not arrived at that state of absolute perfection which constitutes, according to their ideas, the character of genuine wisdom. This opinion may appear true, perhaps, in theory, but is altogether inapplicable to any useful purpose of society, as it supposes a degree of virtue to which no mortal was ever capable of rising." 14. "I don't mean to diminish the job, it's a good job and a real pressure job. But I don't think a relief pitcher should ever be the most valuable player of a league. We only play in maybe half of the games. Being a relief pitcher means part-time employment. We're bench players, and bench players shouldn't be M.V.P." 15. "I hate all electronic toys: cell phones, e-mail, PalmPilots, handheld Global Positioning System equipment, and the whole raft of gadgets that intrude on solitude.When I was a kid I used to disappear into the woods all day. Now I can walk in the wilderness without wasting my valuable time. As I hike along I can call anyone in the world, schedule an appointment, take a picture of me standing next to a tree and then send the person a map so he or she can join me there. Solitude has been snuffed out." 16. "I've built something valuable here. But valuable things also have a way of being misunderstood in their own time. Everyone wants a quick fix. We're tired of being afraid, tired of being sad, tired of feeling overwhelmed, tired of feeling tired. We want the old day back, and we don't even remember them, and we want to push into the future, paradoxically, at top speed. Patience and forbearance become the first casualties of progress." 17. "Whenever that happened, Joey clung to Troy's hand, willing him to know that Riker meant nothing.Well, maybe not nothing. He'd given Joey a valuable gift; he'd taught him what love wasn't. During their showdown in the men's room, it had dawned on Joey what love was. Love took long walks, spent time together talking about nothing. It gave smiles, and hugs, and trips to the beach when it really didn't want to go, because it wanted to share a special place with someone else. Love gave away possessions it valued, knowing the receiver valued them more. Love admitted being wrong, said it was sorry, and did whatever it took to make things right. It called in favors and put a town on the map to make life better for one person who lived there.Love was Troy." 18. 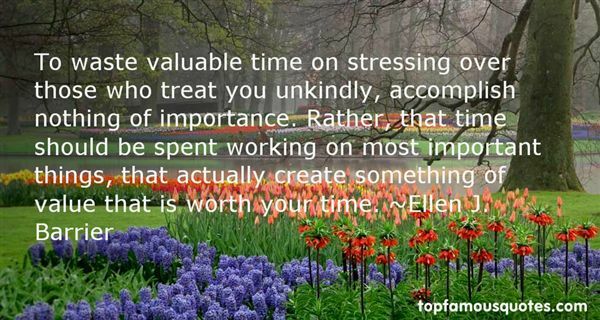 "To waste valuable time on stressing over those who treat you unkindly, accomplish nothing of importance. Rather, that time should be spent working on most important things, that actually create something of value that is worth your time." 19. "Trust is so valuable. It's sometimes hard to gain, but so easy to lose. One must always be careful about trusting another, but there are times where people are too careful or too afraid & forget how to open up to those who won't do any harm. Choose wisely who you trust, but don't worry too much. Disappointment occurs, but life goes on"
20. "Aren't these the finest treasures? Each one springs up, and becomes more red than rubies, more fine than diamonds adn more valuable, so we are told; and before you can run back here again to look, the petals have begin to drop and the leaves to yellow. Look, they sag, they fall. Are they the more wonderful because they live such a short time." 21. "[...] he made it a rule never to touch a book by any author who had not been dead at least 30 years. "That's the only kind of book I can trust", he said. "It's not that I don't believe in contemporary literature," he added, "but I don't want to waste valuable time reading any book that has not had the baptism of time. Life is too short." 22. "To be chosen as the Beloved of God is something radically different. Instead of excluding others, it includes others. Instead of rejecting others as less valuable, it accepts others in their own uniqueness. It is not a competitive, but a compassionate choice. Our minds have great difficulty in coming to grips with such a reality. Maybe our minds will never understand it. Perhaps it is only our hearts that can accomplish this. Every time we hear about 'chosen people', 'chosen talents', or 'chosen friends', we almost automatically start thinking about elites and find ourselves not far from feelings of jealousy, anger, or resentment. Not seldom has the perception of others as being chosen led to aggression, violence, and war." 23. "Which makes his good manners the more valuable. The older a person grows, Harriet, the more important it is that their manners should not be bad—the more glaring and disgusting any loudness, or coarseness, or awkwardness becomes. What is passable in youth, is detestable in later age. Mr. Martin is now awkward and abrupt; what will he be at Mr. Weston's time of life?" 24. "I feel if some kid has sat down and felt I'm important enough to write two pages of words to and take up a lot of his valuable time, then he deserves a few words back, or even a phone call as I have done on a few occasions." 25. "All the charges you enumerate have been made with one purpose in mind-to place our office on the defensive and make us waste valuable time answering allegations that have no basis in fact." 26. "Time is more valuable than money. You can get more money but you can't get more time." 27. "Capturing any member of any terrorist cell or any insurgent cell that we may happen to come across is always very, very valuable, and the thing that interests me is that in most instances after a time, people talk and they tell us what they know." 28. "Arriving late was a way of saying that your own time was more valuable than the time of the person who waited for you." 29. "Normally we divide the external world into that which we consider to be good or valuable, bad or worthless, or neither. Most of the time these discriminations are incorrect or have little meaning. For example, our habitual way of categorizing people as friends, enemies, and strangers depending on how they make us feel is both incorrect and a great obstacle to developing impartial love for all living beings. Rather than holding so tightly to our discriminations of the external world, it would be much more beneficial if we learned to discriminate between valuable and worthless states of mind." 30. "The more time you spend contemplating what you should have done... you lose valuable time planning what you can and will do." 31. "(It starts with)One thing, I don't know whyIt doesn't even matter how hard you tryKeep that in mind, I designed this rhymeTo explain in due timeAll I knowtime is a valuable thingWatch it fly by as the pendulum swingsWatch it count down to the end of the dayThe clock ticks life awayIt's so unrealDidn't look out belowWatch the time go right out the windowTrying to hold on but didn't even knowWasted it all just toWatch you goI kept everything inside and even though I tried, it all fell apartWhat it meant to me will eventually be a memory of a time when I tried so hardAnd got so farBut in the endIt doesn't even matterI had to fallTo lose it allBut in the endIt doesn't even matter"
32. "....You should keep dental floss on you at all times; when your eyesight goes, quit driving; don't keep too many secrets, eventually they'll eat away at you. But the most valuable lesson he taught me was this: Every day we get older, and some of us get wiser, but there's no end to our evolution. We are all a mess of contradictions; some of our traits work for us, some against us. And this is what I figured out on my own: Over the course of a lifetime, people change, but not as much as you'd think. Nobody really grows up." 33. "In every age, people are certain that only the things they have deemed valuable have true value. The search for love and the search for wealth are always the two best stories. But while a love story is timeless, the story of a quest for wealth, given enough time, will always seem like the vain pursuit of a mirage." 34. "The very valuable time of the humanity often passes with the incredible stupidities and with the local matters not worth a penny!" 35. "In my life Why do I give valuable time To people who don't care if I live or die ?" 36. "Inrealized how valuable the art and practice of writing letters are, and how important it is to remind people of what a treasure letters--handwritten letters--can be. In our throwaway era of quick phone calls, faxes, and email, it's all to easy never to find the time to write letters. That's a great pity--for historians and the rest of us." 37. "Ritsu: "I'm a complete failure. At everything I do, I'm absolutely worthless. I know this, and yet I continue to burden the human race with my presence. Every day I rob the world of valuable air by breathing. I'm a thief, and I hate myself for it. I don't deserve to exist. But even though I know it's the right thing to do, I'm such a useless coward. I don't even have the courage to jump! "Tohru: "No, don't! Don't jump! It's okay that you don't have that kind of courage. The important thing is you're alive. And life hurts sometimes and sometimes it can be hard, but it won't always be that way. There's gotta be a reason for you to live." 38. 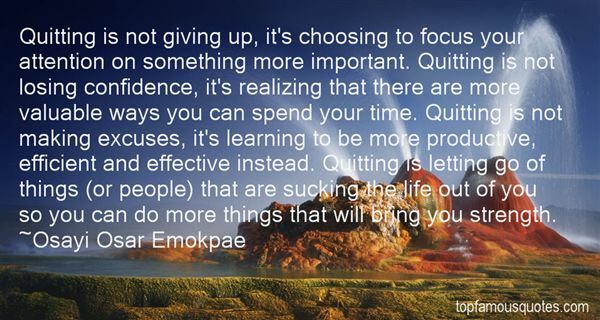 "Quitting is not giving up, it's choosing to focus your attention on something more important. Quitting is not losing confidence, it's realizing that there are more valuable ways you can spend your time. Quitting is not making excuses, it's learning to be more productive, efficient and effective instead. Quitting is letting go of things (or people) that are sucking the life out of you so you can do more things that will bring you strength." 39. "Her library would have been valuable to a bibliophile except she treated her books execrably. I would rarely open a volume that she had not desecrated by underlining her favorite sections with a ball-point pen. Once I had told her that I would rather see a museum bombed than a book underlined, but she dismissed my argument as mere sentimentality. She marked her books so that stunning images and ideas would not be lost to her." 40. "I travel abroad constantly on book promotion and research, and the Internet is invaluable to me for accessing U.K. news in places such as America, which most of the time hasn't heard of England." 41. "The most durable thing in writing is style, and style is the single most valuable investment a writer can make with his time." 42. "Real-life duties eat valuable writing time." 43. "Never waste valuable time, or mental peace of mind, on the affairs of others—that is too high a price to pay." 44. "If you have never said "Excuse me" to a parking meter or bashed your shins on a fireplug, you are probably wasting too much valuable reading time." 45. "Every time we cheer the downfall of a powerful woman, we're giving ourselves the message that power is bad and we shouldn't desire it. Every time we revel in a beautiful woman's aging or weight gain, we reinforce the idea that we, too, are less valuable if we are old or overweight. Every time we gloat over a woman's loss of a husband to a younger, prettier rival, we are reminding ourselves that our own relationship is unstable, that someday our man, too, will move on to greener pastures." 46. "Love is the most valuable gift we can give to another person. What we need to do is to open our heart and release our love to the world, to the people, to nature, to the animals, to the trees and to the sky – and this love will be returned a thousand times to us." 47. "There is a purpose for everyone you meet. Some people will test you, some will use you, some will bring out the best in you, but everyone will teach you something about yourself. Both positive and negative relationships teach you valuable lessons. This is an incredible step toward expanding your consciousness. The road to self-discovery requires help from others. As humans we are always seeking feedback and approval from others. That is how we learn and become better as individuals. No relationship is a waste of time. The wrong ones teach you the lessons that prepare you for the right ones. Appreciate everyone that enters your life because they are contributing to your growth and happiness." 48. "Every day is lost in which we do not learn something useful. Man has no nobler or more valuable possession than time." 49. "The object most interesting to me for the residue of my life, will be to see you both developing daily those principles of virtue and goodness which will make you valuable to others and happy in yourselves, and acquiring those talents and that degree of science which will guard you at all times against ennui, the most dangerous poison of life. A mind always employed is always happy. This is the true secret, the grand recipe for felicity....In a world which furnishes so many employments which are useful, and so many which are amusing, it is our own fault if we ever know what ennui is..."
50. "We can say without exaggeration that the present national ambition of the United States is unemployment. People live for quitting time, for weekends, for vacations, and for retirement; moreover, this ambition seems to be classless, as true in the executive suites as on the assembly lines. One works not because the work is necessary, valuable, useful to a desirable end, or because one loves to do it, but only to be able to quit - a condition that a saner time would regard as infernal, a condemnation." If you slip far enough out of your life, time picks up. Passes in waves instead of notches. One month rolling by, then another."